There are few things gayer than velvet. Spandex and lace come to mind. But get all your preconceived notions about velvet out of your head. It is not just for prom dresses anymore. A velvet blazer is a great closet staple and has surprising versatility. It can be dressed up and dressed down. It is appropriate with a shirt and tie equally as it is when paired with a turtleneck and jeans. Every designer has shown velvet jackets recently. Whether Michael Kors or H&M, the velvet blazer is a trend that looks like it’s staying. Choosing the right color is the most important decision. Choose black, chocolate, or red if you make the holiday party circuit. These colors appear a little more sophisticated. If you want less flash and something more casual we say go for camel, browns, greens, or mustard yellow. These earth tones don’t appear too dressy and look great with a new pair of boots and classic Levi’s. The Gap has a great velvet cord jacket, in black or brown, for only $88. If you can drop a few more bucks then check out Neiman Marcus. 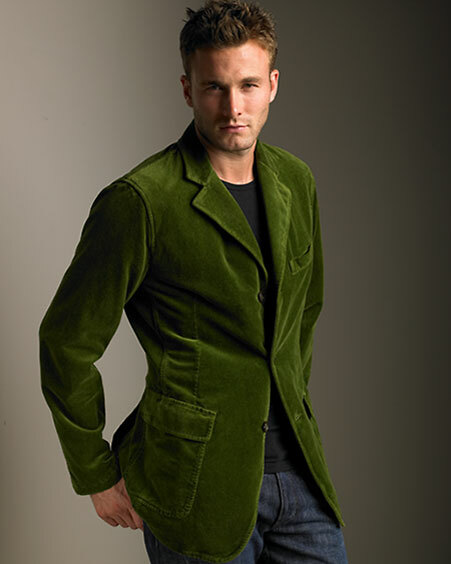 They have a large selection of designer velvet jackets, from Etro and Juicy Couture, in bold colors. And as always thrift shops and eBay are perfect places to find vintage pieces. You could also opt for velvet trousers, but that might be too gay. Even for us.